A popular addition to a landscape is a patio, creating a hard surface to extend the living space from indoors to outdoors. 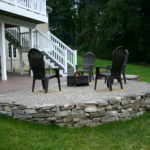 Outdoor living spaces allow for enjoyment of the outdoors by creating dining areas, fire pits, seating walls and even built-in bars and grills. The main factor in deciding which materials to use is the installation method and durability of material types. Paver patios are easier to maintain and repair. There is no cure time. They are more durable, and they are very versatile. Using natural stone pavers delivers a high quality product. Although the popularity of stamped concrete has grown over the years, there’s nothing like the beauty and quality of natural stone. Due to the installation methods and crushed stone base, these systems last longer and are more durable than stamped concrete systems. If a paver cracks or chips, the broken pavers can be removed and replaced. This cuts down on maintenance costs over time. There is also no cure time with pavers. Once the pavers are laid, they are ready to be walked on. Pavers are built to withstand the freeze and thaw cycles of the seasons. The only real maintenance to be done is to power-wash every 5-7 years and fill in the poly-sand if needed. 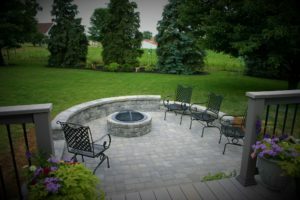 With the increase in use of paver patios, the selection has also increased. Paver patios can virtually be built into any pattern, color or size. The only real ‘con’ to patio pavers is the cost. Pavers are hand laid, one-by-one, which increases the labor cost to the project. 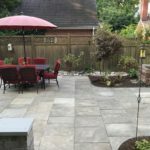 As a long-term maintenance cost between the two, pavers will cost less in the long-term considering the cost of having to re-do a concrete patio when it cracks. There is a lot less labor needed to for the installation of concrete since it can be poured into virtually any shape, color or size. This also allows the designer to be very creative in the design phase of the patio. On the other hand, there are a good bit of disadvantages as well. Concrete tends to crack sooner than paver systems. Sealant can be slippery which can be dangerous. In Pennsylvania, concrete patios develop cracks sooner due to the northeast climate of the freeze and thaw cycles from Fall to Spring. The rigid system of concrete holds more water than that of a flexible paver system. This ultimately leads to molecules contracting during the winter (freeze) and then expanding during the spring (thaw) when the temperatures begin to rise. The expansion of the pore spaces within the concrete leads to cracking which is not as prevalent in paver systems. 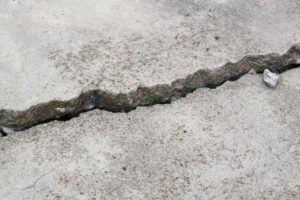 When a concrete pad cracks or chips, the only way to completely repair it is to rip out the entire pad and start over. Still not sure? Book an appointment today with our designer Jason to discuss in more detail the advantages of natural stone pavers. and then can be replaced if broken. This would probably be a good thing to use in a patio space. My wife and I are going to try to landscape our backyard and a patio is something we would like to do. We’ll have to look into stamped concrete as an option. Thank you for your comment! 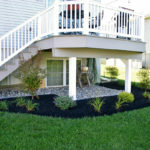 At Indian Run Landscaping, we want to make sure we deliver quality to our customers. 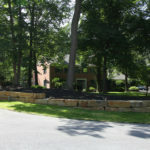 This is why we choose to work with natural stone and not concrete. 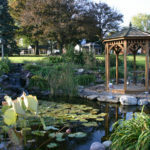 Good luck with your landscaping and patio project! If you are in our service area, we can get you a free estimate! I like that stamped concrete is typically less expensive. My patio is really old, so I’ve been wanting to get a new one. It sounds like stamped concrete would be a great way to decorate. You are correct, stamped concrete is usually less expensive than natural stone or pavers, and with all the different ways stamped concrete can be done, it also is very appealing to many people. We like to work with natural stone which will not crack when being exposed to changes in temperatures like concrete can. Also, if a stone paver is damaged somehow, it can be replaced by the piece. If stamped concrete needs to be repaired, the whole project will need to be replaced. Which will cost more in the end. Good luck with your new patio. Terrific work! This is the kind of info that should be shared around the web. I also like stamped concrete.